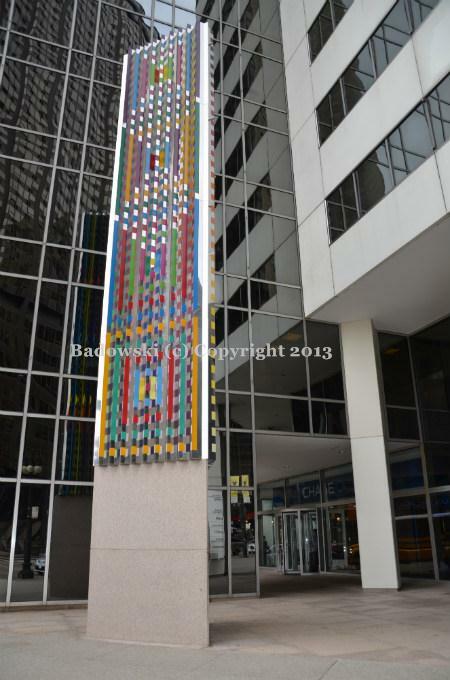 Israeli artist Yaacov Agam, a pioneer of kinetic art, was commissioned to create a sculpture for 150 North Michigan Avenue. 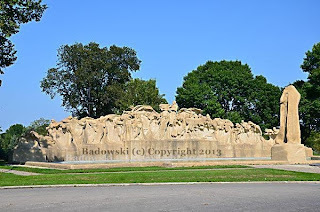 It was dedicated in 1983 during a ceremony with Mayor Harold Washington. In kinetic style, the multi-colored work appeared to change, depending on the vantage point of the viewer and his or her movement past the piece. Over the years that followed, the harsh Chicago weather faded the sculpture and the paint began to peel. In 2005, Jones Lang LaSalle Inc., a Chicago-based real estate firm that manages the skyscraper at that location, took down the piece and hired an expert to restore it. 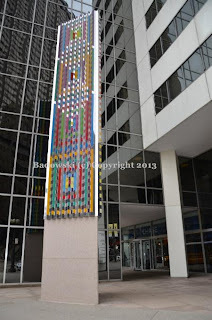 While Jones Lang LaSalle Inc. stated that Agam was consulted during restoration, three years later, when the piece was reinstalled after completion of the $300,000 project, the artist was less than happy with the result. He believed the colors were not restored to the exact shades he originally used and alleged that the work was not a restoration but rather an unauthorized reproduction. In an 2008 telephone interview with the Chicago Tribune, the artist stated, "The public should know that this is not a real Agam." The son of an Orthodox rabbi, Agam considers himself a "visual rabbi." 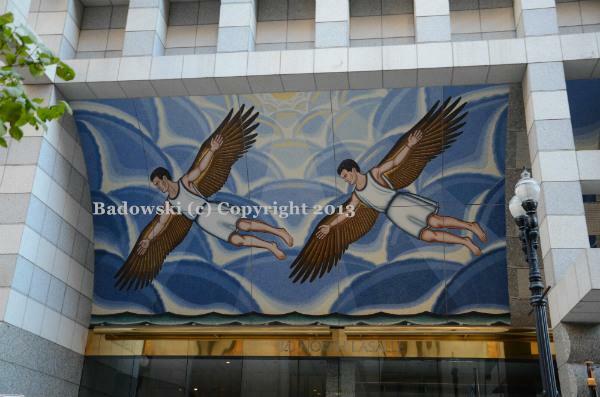 He urges those who view his works to view them as "visual prayers." UPDATE: This piece was removed and put into storage in 2018. Philanthropist and art patron Kate Sturges Buckingham (1858 – 1937) , best known for her donation of the Clarence F. Buckingham Memorial Fountain to the city, considered Alexander Hamilton “one of the least appreciated great Americans.” It was her belief that the first Secretary of the Treasury was responsible for securing the nation’s financial future, hence making it possible for her family to make its fortune in grain elevators and banking. In 1928, she established a fund and pledged $1 million to the Chicago Park District with the intent to create a memorial honoring the founding father. By the time of her death in 1937, with at least $41,000 already spent on the project, the sculpture’s setting and location were uncertain. Her will directed the trustees of the Alexander Hamilton Trust Fund to complete the project and, if it was not completed with 10 years, the monies would go to the Art Institute. 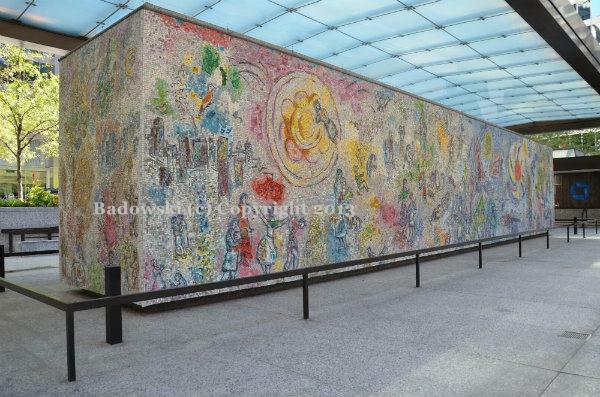 In 1943, a lawsuit was filed by the States Attorney for Cook County accusing the committee, which included two directors at the Art Institute, of purposely slowing the project. The judge in the case put a moratorium on the project until the end of the ongoing war. The courts later ordered the project to be completed by 1953. 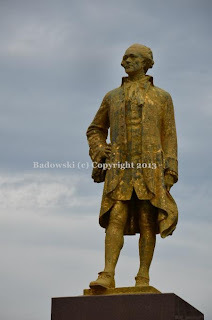 The trustees decided to gild the bronze statue that had been put into storage four years after Buckingham’s death and hired architect Samuel A. Marx (1885– 1964) to create a new granite setting for a site in Lincoln Park. On July 6, 1952, 24 years after Buckingham made the original offer, the monument was finally installed. The gilded sculpture sat on Marx’s 78-foot-tall cantilevered granite exedra until 1993. At that time, flaws were found in the structure that made it unsafe and required demolition. The re-gilded statue now sits on the only remaining element of the original structure, a red granite base. Additional works by Angel can be found on the Cook County Courthouse as well as St. Patrick’s Cathedral in New York City and the Shrine of the Immaculate Conception in Washington, D.C.